About five months ago, Jackson Group said they'd be the first apartment management company to team up with the Arts Commission to battle a persistent graffiti problem with — wait for it — a mural. WIth fingers tightly crossed that taggers would love the mural too much to dare profane it, they went ahead and got artist Francisco Aquino, a.k.a. Twick, on board, according to Uptown Almanac. 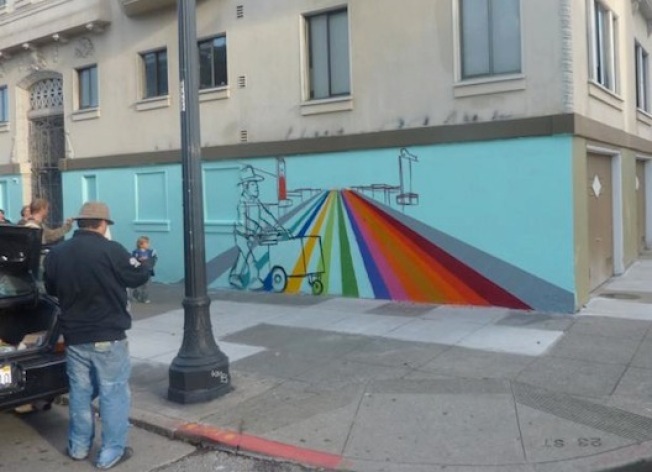 The result: a cowboy pushing an ice cream cart across a rainbow road. Godspeed, little graffiti-fighting mural.